This page will walk through Angular minlength and maxlength validation example. In template-driven from we need to use minlength and maxlength attributes with ngModel in HTML elements such as text input. In reactive form we need to pass Validators.minLength and Validators.maxLength in FormControl while creating FormGroup. We can also use minlength and maxlength attributes with formControlName in reactive form. Angular 4 uses novalidate attribute by default in its form element at run time and hence while submitting form, HTML 5 validation will not work. If we are using Angular 2, we need to write novalidate attribute in our form element to use Angular form validation. In Angular 4 template-driven form we can use ngNoForm to enable HTML 5 validation. 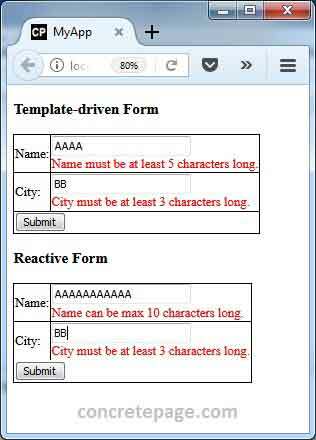 Here in our example we will provide demo for Template-driven form as well as Reactive form for Angular min and max length validation. Now find the complete example step by step. Angular provides MinLengthValidator directive to validate minimum required length for input such as text input. We can use its selector minlength with formControlName, formControl and ngModel in HTML template. Validators.minLength can be passed in FormControl while creating FormGroup. Here we will provide sample code for min length validation with template-driven form as well as reactive form. In text input we need to use minlength attribute. In the above code snippet, minlength has been assigned with the value 5. It means the value entered in text input must be of 5 characters minimum. To display validation error message, we can write code as below. Name must be at least 5 characters long. In reactive form we need to use Validators.minLength with FormControl while creating FormGroup. We will write code in HTML template as following. To display validation error message, we need to writer a getter method as given below. Now display validation error message as following. To validate minimum length in reactive form we can also use minlength attribute with formControlName as following. Angular provides MaxLengthValidator directive for max length validation. We can use its selector maxlength with formControlName, formControl and ngModel in HTML template. Validators.maxLength can be passed in FormControl while creating FormGroup. Here we will provide code snippet for max length validation using template-driven form as well as reactive form. We need to use maxlength attribute in input text for max length validation. When user starts entering value, only the max 10 characters can be entered. We need to pass Validators.maxLength in FormControl while creating FormGroup. Max length validation error message can be displayed as following. Name can be max 10 characters long. We can also use maxlength attribute with formControlName. City must be at least 3 characters long. City can be max 8 characters long.